Longtime Blue Jays Minor League instructor Mike Mordecai received a long-awaited promotion to the big league club in 2018 when he was named Toronto's new quality control coach. 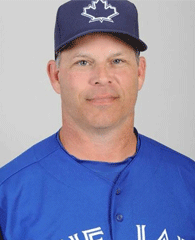 Mordecai entered his eighth season with the Blue Jays after having spent the previous year as an assistant field coordinator. He initially joined the organization in 2010 as a Minor League infield coordinator, and he earned rave reviews for his defensive work with then prospect Brett Lawrie. Mordecai played parts of 12 seasons in the Major Leagues with stints in Atlanta, Montreal and Florida. He was a career .244 hitter, and he retired in 2005 before coaching high school baseball and later joining the Blue Jays' organization. In 1994, Mordecai made it to the majors for the Atlanta Braves, when he replaced Jeff Blauser on the roster. Mordecai's first hit was a three-run home run in the ninth inning against the Philadelphia Phillies. Mordecai continued to torment the Phillies throughout his career. He received the John M. Zwack III Memorial Award for being the most community-minded player. Mordecai played on the 1995 World Series team as a bench player. He made his first start at second on July 16 at San Diego. In the NLDS he went 2-for-3 with a double and 2 RBI. His pinch-hit single in the ninth inning of Game 2 gave the Braves the go-ahead run. In the World Series, he went 1-for-3. Mordecai was the Braves' starting third baseman on opening day in 1996 and on August 30, he collected the first three-hit game of his career at Chicago. Mordecai joined the Montreal Expos in 1998. Mordecai made 53 starts the next year. He then enjoyed his best seasons there in 2000 and 2001. On April 2, 2001, Mordecai demonstrated his versatility by playing catcher in the tenth inning of a game against the Cubs after Montreal's first catcher, Michael Barrett, was ejected and their second catcher, Sandy Martínez, was injured. In the midst of the 2002 trade deadline he was traded to the Florida Marlins. His statistics for the season drastically improved after the trade. The following season, he was again a key part in helping the inexperienced Marlins win the 2003 World Series. In Game 6 of the NLCS, the Marlins were five outs away from being eliminated when Cubs fan, Steve Bartman, prevented a foul ball from being an out by extending his arms over Moisés Alou while Alou attempted to field the pop-up. Mordecai's consequent three-run double blew the game open highlighting the Cubs' subsequent historic collapse in what is sometimes referred to as simply "The Inning". Mordecai took a job as manager with the Marlins minor league affiliate Jamestown Jammers in December 2004. A few days later, the team announced that they would give him a chance to join the team in September so he could reach ten years of Major League service; Mordecai played two games in 2005 before retiring for good. Mordecai also worked as a batting coach for MLB before turning to coaching for a private High School in Dothan, Alabama. The school is Dothan is Houston Academy. His last high school game was against the Leroy Bears on the road in the first round of the Alabama State High School Playoffs in 2009.